You’ll be lovin’ summer at this stylish, elevated coastal gem. Take in the stunning sea and estuary views, or take a dip in the heated swimming pool. Relax in the outdoor bath, or create a masterpiece in the large artist’s studio. Then, if you can draw yourself away, magnificent white sand beaches, a private boat ramp and spectacular walking tracks over the sand dunes are right on your doorstep. All this and more less than 75 minutes drive from central Auckland. Where in the world would you rather be? Be mesmerized by Pacific Ocean views swimming with sea life, including whales, dolphins and orca. Live the dream on 2.9 acres, in an architectural vision that showcases endless ocean views. Private and spacious, this unique four bedroom home makes the most of it’s prime Bay of Islands location, in wonderful Whananaki. 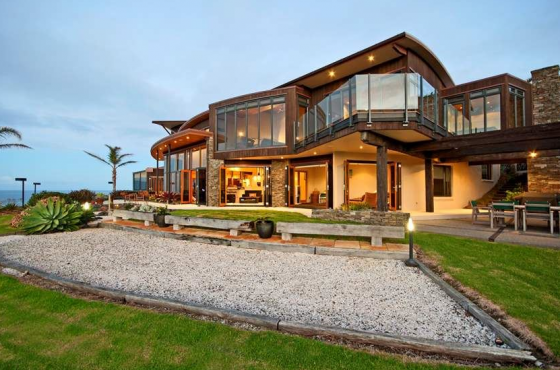 Spend summer in this exquisite 1800sqm mansion on Waiheke Island, set on 34 acres with breathtaking views. This six bedroom, seven bathroom home has it all. The indoor pool has a drop down movie screen and surround sound. The six acre vineyard supplies a boutique winery. And the elegnat design and impeccable finish won this residence the Auckland Master Builder’s Home of the Year in 2012. Relax and enjoy kiwi living at it’s best in Parua Bay. Soak up the commanding 180 degree water views and incredible sunsets. Be serenaded by the resident Kereru and Tui who call the abudent native bush home. Invite friends to the separate self contained accommodation, and share the harvest from your green house, orchard, and mature gardens. Half an hour away from Whangarei, positioned on 4.1278 hectares with private beach access. Summer or winter, it’s hard to beat Queenstown. And this exceptional four bedroom home is undoubtedly one of the finest properties in town. Built to the highest standards, this place features innovative and efficient building methods. Spacious and full of light inside, two large decks are ideal for entertaining during the long summer months. And the panoramic views are literally remarkable. Walk acoss your front lawn to the wide sandy beach, from this comfortable warmly inviting home. Glowing native timbers reconcile beautifully with contemporary features, style and an attention to detail. Nautically inspired front doors swing open wide, inviting you and your guests into the double-height entrance atrium. And at the end of the day, you can watch the sunset over Kapiti Island from the in-built spa pool. Set on the clifftop and facing north this stunning residence is just a short stroll from beautiful Waiake and Browns Bay beaches. A triumph of modern minimalist design, exceptional quality craftsmanship and sophisticated luxury. The living and dining areas flow seamlessly to wide multi tiered decks, an attractive swimming pool and native landscaping. Together with panoramic views over the Hauraki Gulf and beautiful Waiake and the Tor, the result is simply inspirational. Survey 180 degree views over Pohara Beach and Golden Bay from this architecturally designed, superbly appointed 425 square metre home. The basement houses a large double garage and vast workshop area. Generously proportioned living and dining areas, a high tech kitchen, two bedrooms with shared ensuite, a rumpus room and a hobby room are spread across the ground floor. While the upper level contains your master suite, an office plus another bedroom. And if that’s not enough for you, the section next door is available too. What is 'negative gearing' on an investment, how does it work and why do it?